Secure content makes the world go ‘round. Research documents, schematics, patent drawings, business plans, human resource documents, etc. are constantly being passed between contributors and owners. This sensitive information could fall into the wrong hands if mishandled or transferred insecurely, compromising employees and employers. To protect these types of content, Oracle offered the application Information Rights Management. 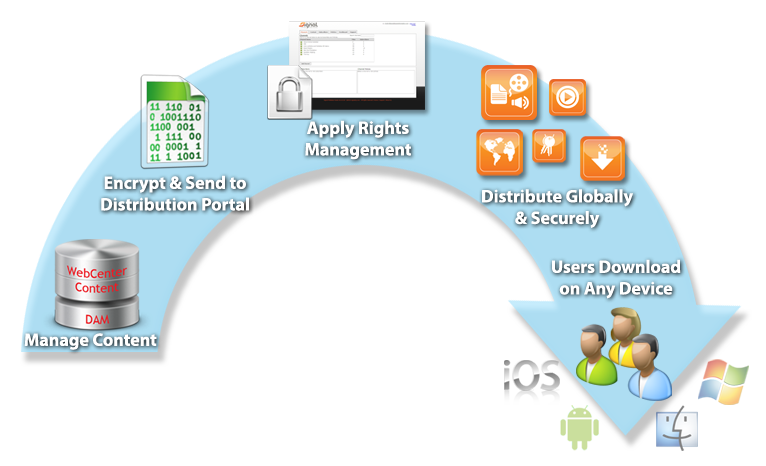 Information Rights Management (IRM) was an Oracle Fusion Middleware application that controlled access to important, private documents and emails through encryption allowing rights access across an organization. Though it served its purpose admirably, the IRM offering was really just a secure application through which material was viewed on the client end – it didn’t handle any distribution from the repository to the client. Now, with Oracle’s sun-setting of IRM, there is a gap to be filled for the secure distribution of content. With Secure Content Publisher for WebCenter Content, TEAM is providing a solution integrated with an ECM repository for secure content distribution and a multi-platform interface through which to view it. We’ve partnered with Qumu (formerly Rimage), a leader in secure content distribution, and developed a synthesis between the distribution stream and the WebCenter Content repository. Establish contributor security, digital asset management processes and content workflows for approval. Content is encrypted before it is transferred to the portal by the publisher application. Access policies can be configured based on date ranges, number of views, viewing periods or prerequisites. Based on access rights and invitations, users download the secure content viewing software for Mac, Windows, iOS or Android, which provides access to the content “channels” set up for various streams of information. Watch this video to learn more and to view a demonstration. For a personal demonstration, or to start enabling your business to share content securely, contact us today! This entry was posted on Wednesday, January 29th, 2014 at 9:55 am and is filed under TEAM Products, WebCenter Content. You can follow any responses to this entry through the RSS 2.0 feed. You can leave a response, or trackback from your own site.